It seems I’m in the stage of life where I have a lot of special occasions that call for me to make a gift quilt. This particular one is for one of my nieces who is very dear to my heart. She lives in Maine, so I don’t get to see her often anymore, but she and her sister spent hours at our house when they were growing up. She is getting married in August, so of course I got started on a quilt for her. 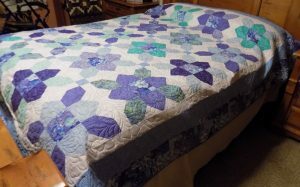 The quilt pattern is called Prairie Flower and I got the idea from a tutorial by Jenny Doan of Missouri Star Quilt Company. I’ve seen pictures of Megan’s house and I think this quilt will go perfectly in one of her rooms. I used the leftover fabric to make the quilt on the right to donate to the West Houston Quilter’s Guild to be given to a nursing home resident. 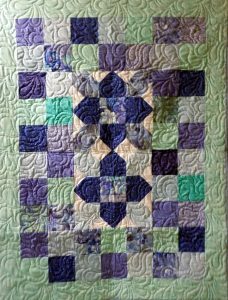 If you have a special occasion coming up and would like to give a unique gift, contact Katy T-Shirt Quilts and we’ll be happy to accommodate you.